I’m OBSESSED with the new children’s line from Schumaker. It is perfect. I like all of it. It is so fresh and colorful without being overdone. I love simple rooms for children. Anyone out there that would let me outfit their new nursery with these beauties? Please? Pretty please? 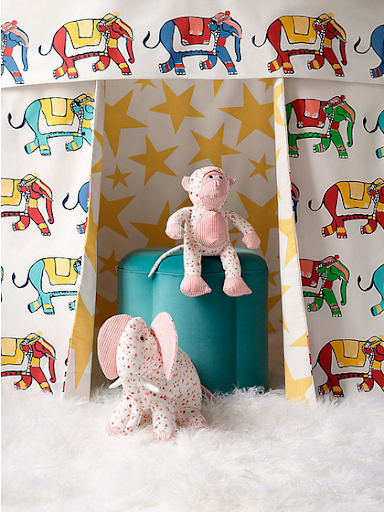 Lulu deKwiatkowski, founder and designer of LULU DK Fabrics, has collaborated with Schumacher on a joyful and sophisticated collection of children’s fabrics. Lulu’s signature style—bold, generous use of color and whimsical hand painted designs—is evident throughout this line of coordinating prints and embroideries. LULU DK | Child features eight prints and six embroideries on cotton grounds, including an embroidered tape. The color palette mixes pastels and brights, which are well suited to the enchanting array of animals, butterflies, small patterns, and overscaled motifs. The collection provides diverse options for girl’s and boy’s rooms, from infants to teens, as well as for a variety of casual interiors.